The 2009 Audi A4 is a new car, as closely related to the recent A5 as to the outgoing A4. At once familiar as an Audi yet obviously new, it is what you can't see that is most changed. The 2009 A4 is wider and longer but no taller than its predecessor. It's larger inside with the most notable improvement to rear-seat legroom and it has a bigger trunk that is easier to load. A large increase in wheelbase, which is more than six inches longer than before, increases cabin space and improves ride quality and handling. For the first time, an adjustable suspension similar to that used on larger Audis is available on the A4. While the engine sizes of 2.0 and 3.2 liters may look familiar both have been revised. Each offers more power and better fuel economy than before. EPA ratings range from 17/26 mpg to 23/30 mpg. All three transmissions have been updated, also. A4 sedans are available with the 2.0-liter turbocharged and 3.2-liter V6 engines, front-wheel drive or all-wheel drive, and with six-speed manual gearbox, automatic or CVT automatic. The 2009 A4 Avant (wagon) comes exclusively with the 2.0-liter turbo, six-speed automatic, and quattro all-wheel drive. Avants appear more expensive because quattro and automatic transmission are standard. Each is offered in three trim levels with added features and amenities commensurate with price. Despite the modest size the A4 comes well-equipped with leather, moonroof and automatic climate control as standard. Features normally associated with big luxury cars are available. Adaptive cruise control, lane departure warning and a half-kilowatt surround-sound system come standard. The new A4 is much better balanced than previously and it is a delight to drive. It's compliant enough to soak up bumps like a larger car but firm enough to feel solid and stable to its (tire-limited) top speed. It rides like a larger car but also handles better than it did, the front-drive version perhaps not as delicately precise as a rear-drive 3-Series but quattro more than holds its own against the other all-wheel-drive cars. It more than holds its own in the rain against other sporty cars. The Audi A4 competes primarily against the Mercedes C-Class and BMW 3 Series. Also in its class are the Acura TSX and TL, the Infiniti G37 sedan, the Lexus IS, the Lincoln MKS, and the Volvo S40. The A4 has on average more passenger room than the BMW 328, Mercedes C300, or Lexus IS250, a larger trunk, more torque, better mileage and standard leather for a lower price. The 2009 Audi A4 is available as a four-door sedan or wagon (Avant) and comes with a choice of four-cylinder and V6 engines, and front-wheel drive and all-wheel drive. The A4 Premium is the entry trim level, which comes with a 2.0-liter turbocharged four-cylinder engine, continuously variable transmission, and front-wheel drive ($31,000). A4 quattro Premium ($31,850) comes with all-wheel drive and six-speed manual. A six-speed Tiptronic automatic is optional. Premium models include leather upholstery and metallic trim, climate control, moonroof, power front seats with four-way driver lumbar, leather-wrapped multifunction steering wheel and shifter, Audi Concert stereo with color display and Sirius satellite radio, MMI Multi-Media Interface, power heated mirrors/windows/locks, front fog lights and rear fog lights, and 17-inch alloy wheels. A4 Avant Premium ($34,500) comes standard with quattro all-wheel drive, the 2.0-liter engine and a six-speed automatic transmission. Avant also comes standard with an Open Sky moonroof, roof rails, rear wiper/washer, reversible load floor, and cargo cover. Options include a Sports Package with 18-inch wheels and upgraded tires, shift paddles, sport seats, firmer suspension), wood trim, heated front seats, Bluetooth prep, HomeLink, Audi Symphony audio system, auto-dimming mirror with compass, metallic paints and rear side airbags. A4 Premium Plus sedan ($36,700) and Avant ($38,500) use the same drivetrain choices as the Premium but add a 3.2-liter V6 sedan model with Tiptronic and quattro ($40,000) identified by a gloss-black grille. Most of the Premium interior and electronic options are standard here. Also standard are bi-Xenon headlamps and LED running lights, three-zone climate control, driver memory system, trip computer, rain and light sensors, and wider 245/45R17 tires. Options include voice-recognition navigation with backup camera, sport package, wood trim, rear side airbags and Tiptronic. Top flight is the Prestige model in 6-speed/quattro form on 2.0 sedan ($40,000); V6 automatic quattro 3.2 sedan ($43,300) and 2.0 automatic quattro Avant ($42,300). These add to Premium Plus 18-inch alloy wheels, Advanced key, Audi parking system, Audi side assist (lane departure warning), and a 505-watt, 14-speaker Bang & Olufsen sound system. Options include Drive Select (dynamic steering, adjustable response, continuous damping control, lower ride height), adaptive cruise control, wood trim. The S Line package features a special front bumper and spoiler, side skirts, leather/Alcantara sport seats, contrast stitching, sport suspension, brushed aluminum trim, black headliner,. The Sports package adds S Line 19-inch wheels, shift paddles, sport seats, front lumbar, sports suspension, and rear side airbags. All A4s come with two-stage driver and adaptive passenger frontal airbags, side-impact airbags, curtain airbags, driver knee airbag, Backguard headrests; electronic stability control, ABS, EBD, Brake Assist, all-wheel drive (on quattro sedan and all Avant) and tire pressure monitors. Optional, or standard on higher-line models, are rear side airbags, adaptive cruise control, lane departure warning, rear camera, park assist. The 2009 A4 looks wider, lower and longer than before, in part because it is wider and longer without being taller and in part because the front end is shorter, crisper, leaner and more tapered. It shares the split-grille common to all front-engine Audis, points on the lower air dam that mimic crab pincers, the headlamp housings are more horizontal, and the light elements themselves draw the eye up and back at the corners. When equipped with the bi-Xenon headlights and LED daytime running lights, the A4 looks a bit meaner, especially when the daytime running lights are on (on any A4 the daytime running lights can be enabled/disabled through MMI). They also provide better nighttime vision for the A4 driver (including speed-dependent adjustment) and make the A4 stand out so other drivers see it sooner. The grille is stone gray on four-cylinder cars and gloss black on V6 units. S-Line models add a silver center lip below the grille, sleeker air intakes, side skirts, and finer wheels to give the A4 a more imposing, hunkered-down stance. The wheelbase, the space between the front and rear axles, is 110.6 inches, long by compact sedan standards. To minimize any limousine look the lower character line along the doors sweeps progressively upward toward the rear wheel, and the shoulder character line just below the windows tapers off as it passes the rear door and curves through the taillight lens as it fades in to the fender. Aerodynamics have been improved by 3 percent despite the wider dimensions. The A4 Avant is as aerodynamic as the previous-generation A4 sedan, and while wagons aren't as slick as sedans, wind noise is absent. Rear visibility is good in the Avant thanks to the rear wiper/washer and the added internal volume means the rear window doesn't fog as quickly. Horizontally themed tail light housings frame the rear end. The trunk and cargo hatch openings are slightly closer to the ground than in previous generation models for easier loading. Avants are rated to carry 198 pounds on the roof, more than many SUVs because of the A4's lower center of gravity. Any recent Audi owner will find the A4 interior familiar, though some of the basic black German efficiency has given way to a warmer, more contemporary cabin a bit north of Germany into Scandinavian territory. Unlike its C-Class, 3 Series and Lexus IS competitors, leather upholstery is standard in every A4, and the fit and finish match recent Audis commonly used as benchmarks. Front seats are electrically adjusted with four-way power lumbar adjustment for the driver and manual headrests that adjust for height but not angle (for safety reasons). With generous travel in the tilt-and-telescoping steering column everyone should be both comfortable and properly positioned for driving, and seat support will easily last a tank of fuel on the highway. The sport seats in S-Line or sport packages are even better at keeping you secure without taking away any comfort; only those of wide girth may prefer the less-bolstered standard seat. A driver memory system for seat and mirrors is available. The rear seat is best for two adults or three kids; the center floor hump and console are similar to what you find in most compact four-doors. Seat cushions are pleasantly long and the low-profile headrests on the back seats ensure good rearward vision without passengers yet lift enough to provide passenger comfort and protection. A substantial center armrest offers cupholders and storage within, and doesn't make you fall inward or outward to relax on one arm. The split backrest folds with the narrow part behind the driver, each released by a simple latch without first removing a headrest. Rear seat reading lights and seatback nets are standard, as are LED footwell lights for the toe room under the front seats. Almost and inch and a half has been added to rear seat knee room, though in anything but full-size cars this is typically a pinch point. There are some exceptions (IS front legroom, 3 Series and C-Class rear width) but on average, the A4 offers better head, leg and shoulder room than its primary competitors. The standard moonroof or the big Open Sky roof on Avants let in light and offer the illusion of more spaciousness. The light-colored cabins have complementary trim colors, with a lighter shade for seats, door insert panels and headliner, and darker shades on the dash, door edges and armrests, and carpeting. A metallic-look silver trim is the default, though genuine wood trim (a light honey-colored almond ash or darker walnut) for the glovebox, console and doors may be specified. It's unlikely you will find a more appealing interior at the price. The A4 driver faces a dashboard modeled after other recent Audis, with the console slightly tilted left and center dash angled toward the driver and carried to the same height as the instrument pod; passengers can still reach those controls but it flows to the driver so much better. The center armrest top slides fore/aft and all the controls are within easy reach, the ergonomics faultless. We would prefer the gate for the manual mode on the automatic transmission shifter on the left side (closer to driver) than the right, however. Large dials provide speed and engine revs, with 0 straight down; you may have to recalibrate your clock positions for the speedometer needle and the mid-range of the tachometer may be obscured if you lower the tilt wheel too far (and you'll mask the warning light pod top center). However, with everything properly positioned, all instruments are clearly visible, and with deep amber lighting to preserve eye recovery time, well lit at night. Between the two primary gauges is a message center for gear selected and engaged, radio data, range remaining, outside temperature and so forth. On higher-level cars trip computer data, cruise control distances, and navigation data are shown here as well. At the same height and to the right is a 6.5-inch color screen. On non-navigation cars this does radio, some climate and car setup chores (beep with alarm, unlock driver door only, etc.). On non-navi cars the MMI (multimedia interface) command dial is in the center of the radio panel just below the vents, and it and the similar control for climate immediately below it are illustrated on the screen. On navigation-equipped cars the MMI is ahead of the shifter (or behind it from the driver's point of view). It maintains the eight hard key choices as before and remains among the more intuitive-type systems; the upgrades to the voice-recognition navigation system only make it easier and quicker. With this setup the radio panel reverts to a CD control panel, the screen is larger and it includes a backup camera. Many of the audio and setup controls can be run through the thumbwheels on the steering wheel that both rotate and push-to-click. Automatic climate control with full manual ability is standard on the Premium model, and updated for more efficient operation; it kept a black wagon's occupants comfortable in desert sunshine. On Premium Plus and Prestige models, three-zone climate control gives independent control to each front occupant and a pair of vents with temperature gradient in the back of the center console. Rear window shades are optional if you prefer to avoid aftermarket tint. The standard audio system handles most inputs. The upgraded Symphony system brings better sound at higher listening levels. For the best audio, pop for the Bang & Olufsen system which backs up some added visual drama with 14 speakers fed 10 distinct channels and 505 watts of output. With all that packed into a small four-door, storage spaces are at a premium. Each door has a map pocket that will hold a bottle, both center armrests have small bins, seatbacks have net pockets, and the surprising glovebox can hold more than some papers and the owner's manual. Beyond that, you're headed to the trunk. Trunk space is almost 17 cubic feet on the sedan, giving it a significant advantage over its primary competitors. Add more cargo space by folding the back seat or seats or employing the ski sack pass-through for longer items. Avants have roughly 16.5 cubic feet of space behind the back seat and 34 cubic feet with the seats folded. A side pocket with cargo net, good floor-mounted tie-downs at the corners and a pair of pivoting rings at cover height that can be used as tie-down points or grocery-bag hooks add to its versatility. The cargo floor can be flipped over to a plastic well for carrying messy stuff, and a roll-up net separates cargo or animals from people. When you open the hatch, which can be powered and set to stop at any height, the cargo cover can be released up and forward for better access or rolled up behind the seat. The load lifting height is lower than before, and the hatch opening (39 inches at the base) is bigger. 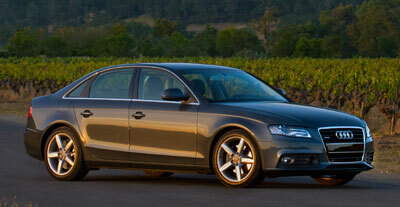 New engines give the 2009 Audi A4 more power and better fuel economy over the respective 2008 versions. Both engines are direct-injection designs for added efficiency. A4 sedan buyers intent on maximum speed can choose a four-cam 3.2-liter V6 that delivers 265 hp at 6500 rpm, 243 lb-ft of torque from 3000-5000 rpm and sweeter mechanical noises by virtue of the added cylinders and timing chains at the back of the engine. It's a fine power source with either transmission but you really need to be bent on maximum performance to choose it over the new iteration of the four-cylinder. The 2.0-liter turbocharged four-cylinder is designed with everyday use in mind. It's not a fire-breathing hot rod like the turbo in a Mitsubishi Evolution, Subaru STi, or Porsche 911. With direct injection and variable exhaust valve lift, the engine starts quickly and at idle has the faintest muffled ticking. Above that it's smoother because the turbocharger is spooled up and generating boost. As a result, the 2.0T delivers 211 horsepower, 26 more than Lexus IS 2.5-liter V6 and just slightly less than the 3.0-liter six-cylinders in the Mercedes C300 and BMW 328 (by 10 hp and 19 hp respectively). Yet far more important for the American driver in a 35 mph world is torque, and the A4's 2.0T dishes up 258 lb-ft of it. This diesel-like urge is more than the A4's V6 or any of the aforementioned engines (by 15, 73, 37 and 58 lb-ft respectively). So the A4 is more than capable of keeping up or passing those other cars. The A4 2.0T can accelerate from 0 to 60 mph in 7 seconds or less. More impressive is the width of the powerband, that area of engine speed that delivers maximum power. The 2.0 turbo makes big torque from just off idle at 1500 rpm all the way to 4200 rpm. And from 4200-6000 rpm it delivers the 211 horsepower. It will rev to 6700 rpm, but there isn't much point when you've got that much midrange power. None of the competitors has that kind of flexibility and, just to rub their noses in it, even with quattro all-wheel drive the A4 betters the BMW, Mercedes and Lexus EPA fuel economy ratings by 4-5 mpg in the City cycle and 2-5 mpg on the Highway cycle. The A4 Avant 2.0T is rated 21/27 mpg City/Highway. In our own mixed driving, which included elevation, rain and snow, it returned better than 25 mpg. The continuously variable transmission in the front-drive 2.0T has wider ratios than before to improve acceleration and highway economy. In Drive it operates completely automatically. A CVT feels differently from a traditional automatic: Engine speed more closely matches how hard you're pushing the gas pedal rather than how fast the car is going, sort of like how a car with a manual transmission feels when the clutch is slipping. With the lever in S for Sport mode the transmission makes eight steps automatically (to feel like gear changes even though they technically aren't). In Manual mode (+/- on the shift lever or shift paddles), you control those eight steps by moving the shift lever or paddles. Six-speed manual cars have a precise shifter with good feel and movement. Likewise, the clutch pedal has simple, low-effort clutch operation. A feature called the drive-off assistant keeps the brakes on while you transition your foot from brake to gas pedal, so even novices can manage an uphill start. Because the A4 can get heavy and the engine is only two liters you may need a few revs on for the smoothest takeoffs, a technique you'll learn by the third stop sign. The six-speed automatic has a new feature to disengage when the car is in Drive but a foot is on the brake, to save fuel, wear, and the creep motion idling automatics want to do. The six-speed auto offers the same modes (D, S, and manual) as the CVT. In D it is smooth yet shifts quickly and maximizes mileage and comfort by using all the torque available. In S it delivers more response for the same gas-pedal application, doesn't shift under heavy cornering loads, and downshifts sooner; as in manual mode, downshifts are rev-matched for smoothness and longevity. In Manual mode you select the gear you want, ideal for winding elevation changes where you know what's coming and want to save a lot of shifting, in traffic to better control speed, or on long descents to save the brakes for stopping. Most A4s come with quattro, Audi's all-wheel drive system. It makes acceleration easier and has differential locks for best low-speed traction. The default split sends 60 percent of engine output to the rear wheels for better driving dynamics and balance. The system is completely transparent to the driver and requires no action. All-wheel drive is more effective for acceleration than traction control because the latter achieves grip by reducing the accelerative force of the front tires. But remember that all-wheel drive merely provides accelerative force to propel the car, and to a lesser extent steer it in low-traction conditions. It does not repeal the laws of physics and uses the same tires and brakes to slow the car. Brakes have been upgraded on the new A4. The new brakes deliver impressive slowing even on base-model wagons with a load in them. Outright stopping performance depends a great deal on tires so we're guessing the Sports package cars might stop the best. An electronic parking brake, operated by a switch on the center console, can give close to maximum effort when needed and hold a decent grade. Weight and its distribution play a part in virtually every aspect of a car in motion. For 2009 most of the A4's suspension pieces are forged aluminum, as is the new front crossmember, the antiroll bars are hollow and the steering rack has been moved for less weight in the moving parts. The rear suspension is sort of a small-scale A6 setup with toe-control trapezoidal links and separate spring and shock mounts that allow a lower floor but more suspension travel, a win-win situation. For better balance Audi put the battery in the trunk and made a change in the drivetrain layout. That movement of the differential a few inches and extra wheelbase it allows pays huge dividends in ride quality, stability, steering reaction, and braking. With the wheels farther apart and carrying closer to equal weight it's easier to make each do its own share of the work, so despite the nose-heaviness caused by the engine and driven front wheels the A4 feels lighter than it is and surprisingly adept at swallowing bumps and road imperfections while still delivering decent cornering. With quattro it's even better, and the wagon's extra weight over the rear wheels makes it entertaining. Our first exposure to the A4 was in a base model Avant: 2.0T, automatic, and generic tires. We were sent out on an active racetrack ahead of Mazda's sportiest RX-8 R3 and behind Audi's mid-engine R8 supersports car running hot laps. The next six miles were laugh-out-loud fun as the R8 never got away and the RX-8 never caught up. In short, we were chasing an R8 in a station wagon. Of course, we're excellent drivers but it was plainly obvious the new A4 is a superb road car, one developed and tuned by people that commute at 130 mph. Over a few hundred subsequent miles we found the A4 equally capable on any road. Longer wheelbase means more time between the bumps and everything gets smoother as wheelbase lengthens. But it never becomes soft or mushy and an impromptu speed bump test that began at 20 mph and progressed to 50 mph rode better the faster we went. We really couldn't find any behavior the A4 does wrong. Yes, stability intervenes on some roads because no stability system reads the road ahead, but it can be dialed back in increments to reward the smooth driver. On sports suspension and tires the ride goes firm but never stiff, and the fun quotient goes even higher. At the highest level, the Drive Select system with dynamic steering and variable damping that calculates shock rates 1000 times/second gives the widest spectrum, comfort-like a base car on 17-inch wheels to stick-like a Sport on 19-inch wheels, and you can program one mode to your liking. We would advise caution considering 19-inch wheels for bad roads like you may encounter in the rust belt or Arkansas I-40. They look great and stick well but cost a lot to replace when you bend or break them. Outward visibility is good in all directions, aided by low-profile rear headrests, sensibly sized pillars, fog lights front and rear, good wiper coverage (including the rear with dual washer jets). More expensive models also benefit from bi-Xenon headlamps that adjust aim at more than 75 mph, a backup camera with parking assist, and side assist for lane changes. The A4 is also quiet to allow hours behind the wheel without fatigue. Despite the largish outside mirrors wind noise is hushed, road noise is kept to a minimum and the engine is heard only when you're working it. The Audi A4 is all-new for 2009 and it's a superb road car. The least-expensive model is nicely finished, has an interior hard to beat at the price and makes a very nice commuter without breaking the fuel bank, while the top-end versions are fitted out like executive autobahn missiles. With the 2009 model the A4 has the goods to go up against its German competitors on the road, Japanese competitors on amenities and style, and arguably the best four-cylinder engine in the entry premium segment. Number-crunchers will find that more room, a larger trunk, more power, better mileage, standard leather, and a lower price make a compelling argument. G.R. Whale filed this report to NewCarTestDrive.com. Head/hip/leg room, f: 40.4/na/41.7 in. Head/hip/leg room, r: 38.2/na/35.2 in. Cargo volume: 34 cu. ft.